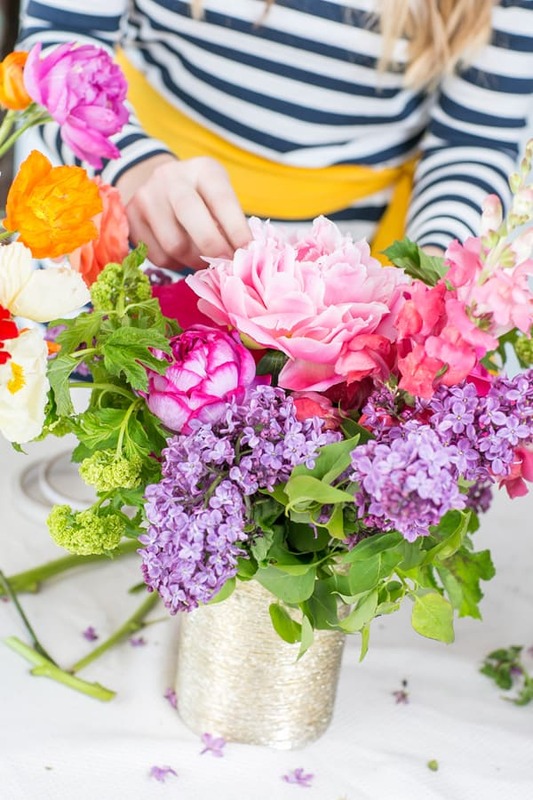 I’m thrilled to have Samantha, creator and owner of the chic Los Angeles-based floral company Primary Petals, sharing her floral arranging tips to creating event-worthy arrangements! She’s incredibly talented and SO much fun to hang with! 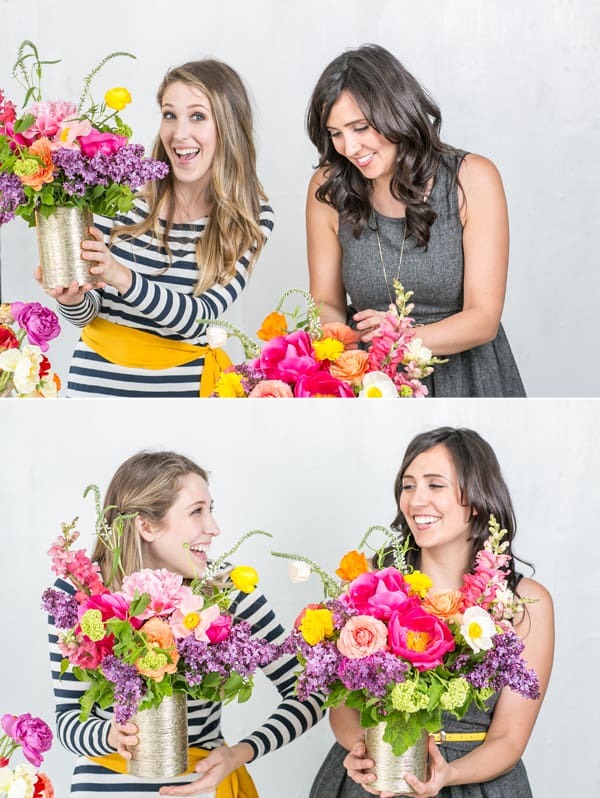 We had a blast putting together these stunning, colorful flowers and I learned some great tips and steps from Samantha… the sweetest floral gal around! I’ve adored Samantha’s work for its bold and bright colors, unique arrangements and her ability to think outside the box when it comes to styling. She’s designed some really awesome pieces just for Sugar and Charm that I’ll be sharing over the next few months! But today, it’s all about creating a beautiful, chic arrangement for your dinner parties and events! So check out the pictures and read the tips below to make your floral arrangements look like a million bucks! 1. Start with a beautiful vase and separate your flowers. Greens, fillers, large colorful and small colorful flowers. 2. Using clear tape, make a grid on the opening of the vase. and then tape around the edge to seal it. 3. Make a base using your greenery. Place in between the taped grid. 4. Use fillers, like the purple flowers to make another layer. 5. Add in the large flowers to create your shape, fill holes and add color. 6. Then you can add in your specialty flowers and taller pieces to make it unique! Make sure you add a little water to them everyday! This arrangement sat on my coffee table for a week and it made me very happy every time I passed by it. I’m dying to make another one soon!! I LOVE having fresh flowers in my house. Thanks for flowering it up with me Samantha! The arrangements are gorgeous! Do you have the source for the vases? Love those too! Thank you!! Samantha bought the vases at a thrift shop in Los Angeles called Son of a Vet and they were only $4 each! It pays to thrift, haha!! Love the flowers and tutorial! Thanks for sharing! Do you know where we can get the vase? Thank you for letting us be apart of this post Eden! The vases are from Moskatels in Downtown LA. They are around $4-$5 a piece. Love the hit of gold in the vases!